An accommodating structure in the Sorrento Peninsula with a strong vocation for the most authentic made in Italy hospitality, consisting of elegance, authenticity, care. DOMO20 is not only a place to stay, but a place to live experiences. 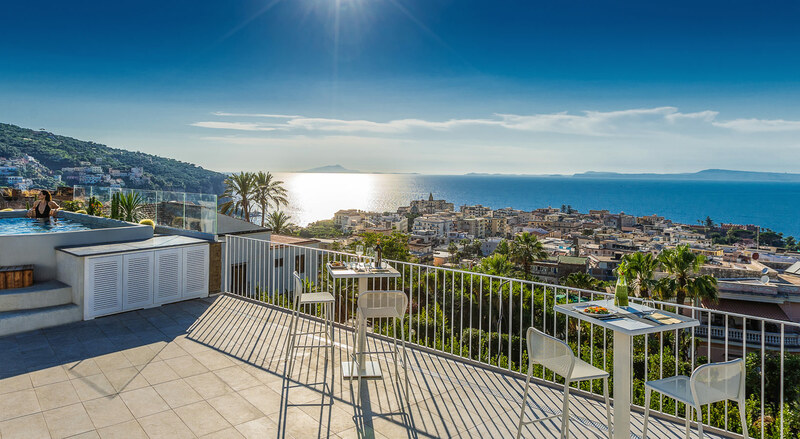 Mediterranean style parquetry and interior design, spacious and comfortable living areas, a roof terrace with a breath-taking view of the Gulf of Naples. The home automation present throughout the structure ensures a truly comfortable stay. The spectacular view of the Gulf of Naples, with the beautiful silhouette of the Vesuvius that dominates the whole coast, to make truly unforgettable the time spent on the terrace. The hydromassage pool, the outdoor lounges, the wellbeing that Domo20 assures to its guests, making the stay in the Sorrento Peninsula a pleasant experience to live and be renewed. The products of the territory are featured in the food and wine proposal, which always moves in the wake of Mediterranean cuisine, preferring quality raw materials and the excellence of the region. An elegant interior room, where the large windows create a sense of seamless continuity with the outdoor environment. A sober and minimalist style that enhances the refined details and the intensity of the flavours. DOMO 20 is located in Vico Equense, halfway between Sorrento and Pompeii, it is the ideal starting point to discover the wonders of the Campania region.